Mike Pence is taking some time off the campaign trail Thursday to visit damaged central Indiana towns, after heavy storms and tornadoes touched down in the governor’s home state. Donald Trump’s vice presidential candidate toured Kokomo, about 40 miles north Indianapolis, and other areas in Howard and Montgomery counties, where most of the damage was concentrated. At a meeting in Indianapolis Wednesday, Pence was briefed by emergency operations personnel about the extent of the destruction. Eight counties confirmed tornado reports, with 15 homes damaged in Howard County and 30 homes in Montgomery County. Pence commented on the storm damage at a press conference in the city’s Emergency Operations Center Wednesday. The veep candidate added that it was “truly remarkable there are such a few number of injuries or worse,” as the tornadoes ripped through Howard County at the worst possible time, coinciding with children leaving school. 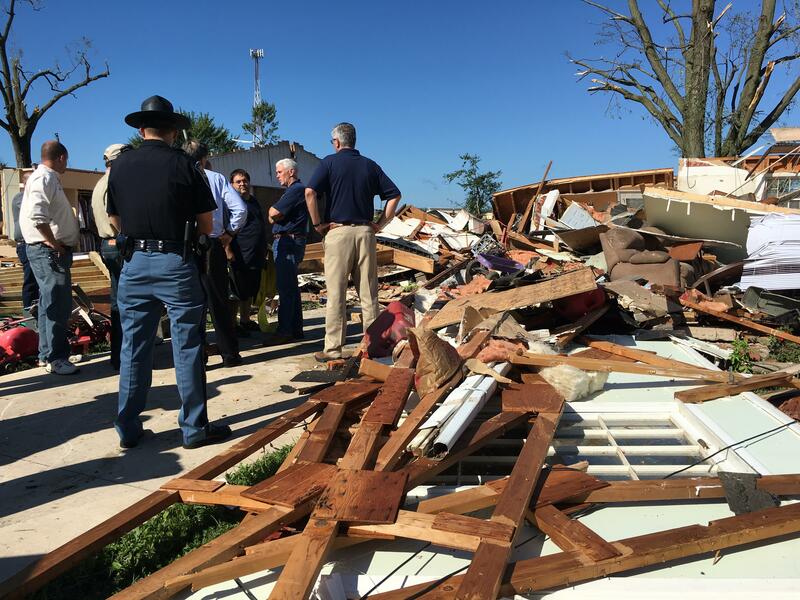 Great Governor @Mike_Pence is in Indiana to help lead the relief efforts after tornadoes struck. True leadership.